New Delhi, August 21, 2018: Raksha Bandhan is one of the most sought-after festivals of the year. While sisters are busy choosing the most stylish, unique rakhi and Raksha Bandhan cards, brothers are planning on how they can make their sisters feel special. To celebrate their companionship, Detel has announced exciting combo-offers on its Mobiles and Accessories starting 24 August to 26 August 2018, exclusively available on Detel’s official website. The company has announced enticing offers on the best of its feature phones – D1 Talkey, D1 Gold, D1 Boom and D1 Sleek. The ‘talking feature’ is a much-loved feature of the Detel D1 Talkey, while the D1 Gold and D1 Sleek are the company’s premium category feature phones. There are two combo offers for Rs. 899 each and another one for Rs. 1,947. 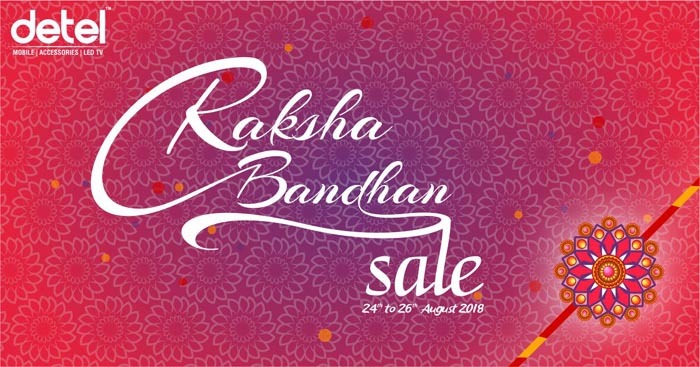 With these offers, Detel is making incessant efforts to make Raksha Bandhan celebration jovial and memorable for every brother and sister with its extensive and unmatched range of products. Boasting to a wide and speedy delivery network, the portal assures the delivery of such orders with next day delivery to the specified address in metro cities. “You cannot always be with your sisters, but can be there for them. This Raksha Bandhan, live the true meaning of the festival by extending the gift of ‘safety’ to your sisters with Detel. All our feature phones are equipped with a panic button to ensure women’s safety on the go”, he further added. Established in 1991, with a CRISIL rating of SME 2, S.G. Corporate Mobility is the parent company of Detel, known for its key relationships with well-established brands in the space of mobiles, laptops, tablets, etc. DETEL believes that technology is no longer a luxury but a necessity. During the Indian Mobile Congress 2017, India’s first ever Mobile, Internet & Technology event, DETEL launched the world’s most economical feature phone in the Indian market- Detel D1 at the price tag of just Rs. 299. The company is now committed to transforming the Television landscape in the country with its affordable 32-inch smart TV.